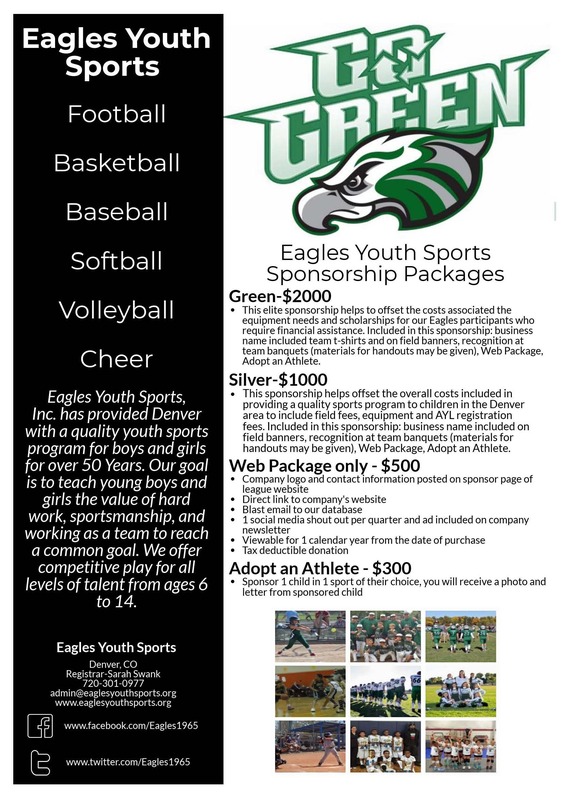 Become a Sponsor | Eagles Youth Sports Inc.
As you know, the Denver metro area is a great sports town known for its tremendous support for our teams. Eagles Youth Sports is proud to provide opportunities for students aged 6-14 to have a safe place to be physically active and make friends by playing sports. Our goal for the last 50 years has been to teach our youth the value of hard work, sportsmanship, and working as a team to reach a common goal; all attributes that will be helpful throughout their lives. Part of our mission is to provide youth sports opportunities to all Denver area youth, which means providing scholarship opportunities and equipment assistance when needed. This is an invaluable service that we are very proud to offer. In addition, we offer some of the lowest registration fees for programs of our caliber in the Denver Metro area to enable more kids to play. But we can’t continue to do this without help. We sincerely appreciate your allegiance to our organization and would like to ask you for a favor. If you happen to be looking for some additional tax deductions this year, or if you own a business or work for a company which is looking to support a local non-profit, would you please provide us with a contact name and phone number or email address? We have some really great sponsorship alternatives available this year and are willing to work to find a sponsorship level that fits with any individual mission. This would help your organization gain exposure among Eagles families and in the broader Denver metro area. Eagles Youth Sports, Inc. is a 501(c)(3) organization and all sponsorships are tax deductible. Thank you in advance for your consideration. Go Eagles!